This tutorial demonstrates how to cut images out, so they can be used as sprites. In this example we have an image of two pirates. 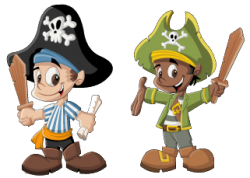 However, we only want the pirate on the right and we also want a transparent background. Click to save this image to your computer. Import the image of the two pirates and open the image editor. Use the 'Crop' tool to cut out the pirate on the right. Click and drag a rectangle over the pirate to select it. Set the color of the fill to transparent. To do this, set the 'Opacity' of the color to 0 in the advanced settings of the color window. Set the 'Tolerance' to 50. This means any colors similar to the color we replace, will also be filled. Select the white area around the pirate. It will be replaced by the transparent color. If you are using a different image and you still have small bits of image you need to make transparent, try using the 'Erase' tool or the 'Cut Out' tool. You now have a sprite with a transparent background that can be used in your animation.